What is the approximate mass of a proton? Which formula represents an organic compound? Which energy conversion must occur in an operating electrolytic cell? In the actual Jan 2014 regents the answer choice shown is NaOH (s). I have posted in this question NaOH(l). The liquid conducts electricity, solid does not. Please email me at regentspreponline@gmail.com if you would like to comment on this question. Keep Calm and Study Chemistry. Kevin. electrons occupying higher energy levels when there are lower levels available are considered to be excited. Since the electron is still part of the atom and has not been removed it is still an atom and not an ion. Which particle has no charge? Neutrons are neutral. Reference Table 0. Which quantity represents the number of protons in an atom? CRT – Periodic Table. Look at the KEY at the top center for Carbon. Use the Periodic Table. Look for the zig-zag line. Elements to the right are metals. Elements to the left are Non-Metals. Elements touching the line are all metalloids (B, Si, Ge, As, Sb, Te, and At), EXCEPT Al and Po* (aluminum and polonium*). Po is noted as being a metalloids in some books. 2. Use the Periodic Table in the CRT. Look for the zig-zag line. Elements touching the line except for Al and Po are all metalloids, elements to the right are METALS and elements to the left are NON-METALS. Elements in the same group all have the same valance electrons, therefore exhibit similar chemical properties. e.g the Group 17 – The Halogens – all have similar chemical properties, all have 7 valance electrons. Use the Periodic Table. Look for Group 2. What is similar? What is formed when two atoms of bromine bond together? There are 7 diatomic elements in the periodic table, N, O, F, Cl, Br, I, (which makes the shape of a 7 in the PT) and H.
Which term represents the attraction one atom has for the electrons in a bond with another atom? Case A. 20 g of salt dissolved in 100 g of water. Case B. 10 g of salt dissolved in 100 g of water. Both cases are a mixture – but the proportion of salt in the water is different, therefore it is a mixture but the proportions of its components can vary from one sample to the next. NaCl is a compound, and the ratio of the elements: Na to the Cl is fixed in both cases C and D, therefore the proportions of its components are fixed can cannot be changed from one sample to the next. Some physical properties of two samples of iodine-127 at two different temperatures are shown in the table below. Powdered iron is magnetic, but powdered sulfur is not. What occurs when they form a mixture in a beaker at room temperature? The iron retains its magnetic properties. the iron loses its metallic properties. The sulfur gains magnetic properties. The sulfur gains metallic properties. They are mixed and therefore retain their original properties. Which property is a measure of the average kinetic energy of the particles in a sample of matter? According to the kinetic molecular theory, which statement describes the particles of an ideal gas? The gas particles are arranged in a regular pattern. The force of attraction between the gas particles is strong. The gas particles are hard spheres in continuous circular motion. The collisions of the gas particles may result in the transfer of energy. have collisions that may result in a transfer of energy between particles, but the total energy of the system remains constant. Collision theory states that for a reaction to occur there must be an effective collision. An effective collision is when reactants collide with sufficient kinetic energy and proper orientation (angle). Which type of formula represents the simplest whole-number ratio of atoms of the elements in a compound? Which class of organic compounds contain nitrogen? Which term identifies a type of organic reaction? Which compound is classified as a hydrocarbon? Which compound yields H+ ions as the only positive ions in an aqueous solution? Which statement describes the relative masses of two different particles? A neutron has less mass than a positron. A beta particle has less mass than a neutron. An alpha particle has less mass than a positron. An alpha particle has less mass than a beta particle. Which term represents a type of nuclear reaction? Which ion has the smallest radius? Equal amounts of ethanol and water are mixed at room temperature and at 101.3 kPa. Which process is used to separate ethanol from the mixture? Bonds are broken, and the reaction is endothermic. Bonds are broken, and the reaction is exothermic. Bonds are formed, and the reaction is endothermic. Bonds are formed, and the reaction is exothermic. A sample of chlorine gas is at 300. K and 1.00 atmosphere. At which temperature and pressure would the sample behave more like an ideal gas? decreased by a factor of 200.
increased by a factor of 200. 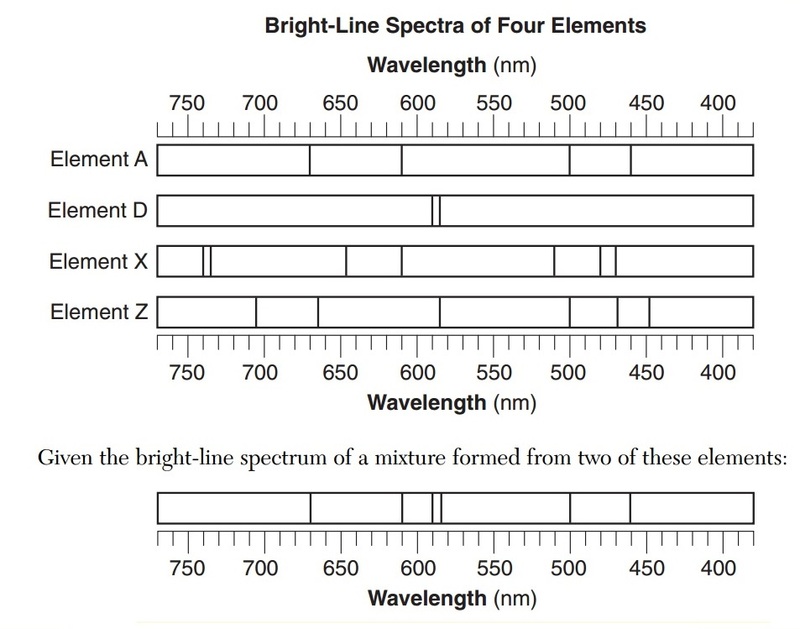 The bright-line spectra produced by four elements are represented in the diagram below. Which elements are present in this mixture? 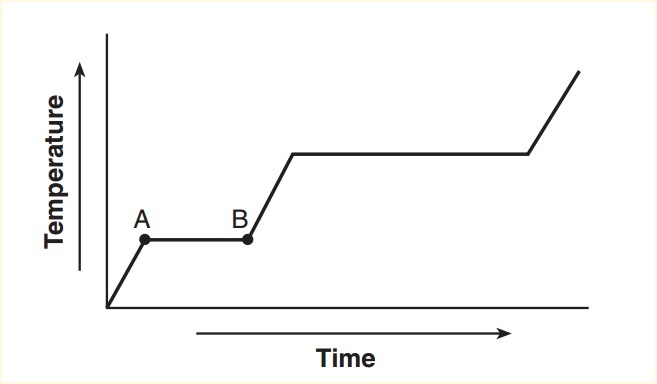 The graph below represents the relationship between time and temperature as heat is added at a constant rate to a sample of a substance. During the interval AB, which energy change occurs for the particles in this sample? The potential energy of the particles increases. The potential energy of the particles decreases. The average kinetic energy of the particles increases. The average kinetic energy of the particles decreases. Each interval on the axis labeled “Potential Energy (kJ/mol)” represents 10. kilojoules per mole. What is the activation energy of the forward reaction? 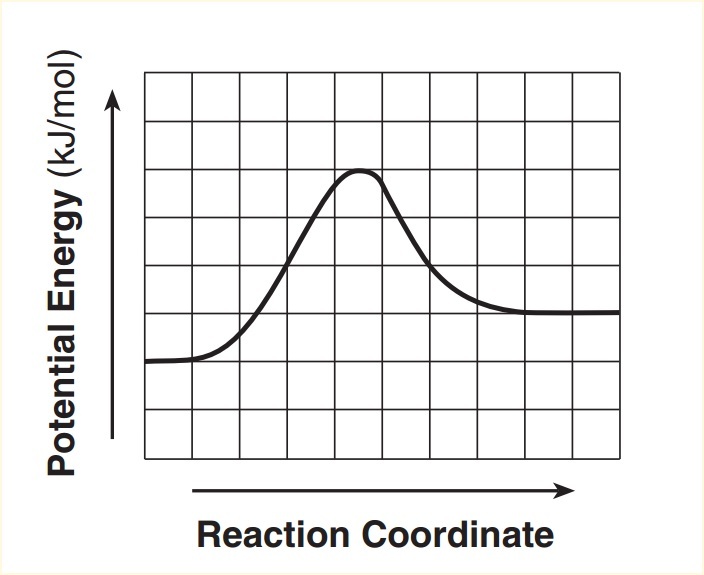 Activation energy is the difference between the (reaction coordinate (highest point on graph) – PE of reactants (first flat region of graph when you start). 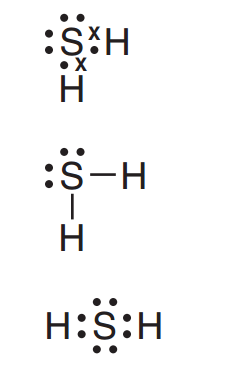 Which condensed structural formula represents an unsaturated compound? Which element reacts spontaneously with 1.0 M HCl (aq) at room temperature? What is the number of moles of electrons gained by 3.0 moles of lead ions? What is the amount of heat energy released when 50.0 grams of water is cooled from 20.0°C to 10.0°C? What occurs at one of the electrodes in both an electrolytic cell and a voltaic cell? Oxidation occurs as electrons are gained at the cathode. Oxidation occurs as electrons are lost at the anode. Reduction occurs as electrons are gained at the anode. Reduction occurs as electrons are lost at the cathode. Which reaction releases the greatest amount of energy per kilogram of reactants? Next select the answer choice ‘CORRECT’ if you have the question correct or ‘INCORRECT’ if incorrect. Consider the Period 3 elements in the diagram in order of increasing atomic number. 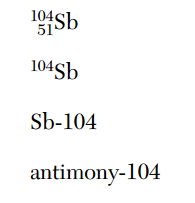 State the trend in electronegativity fro these elements. As atomic number increases, the electronegativity increases. Compare the number of atoms per cubic centimeter in red phosphorus with the number of atoms per cubic centimeter in white phosphorus. White phosphorus has fewer atoms per cm3. Identify one element from the diagram that will combine with phosphorus in the same ratio of atoms as the ratio in aluminum phosphide. The compounds KNO3 and NaNO3 are soluble in water. Compare the entropy of 30. grams of solid KNO3 at 20ºC with the entropy of 30. grams of KNO3 dissolved in 100. grams of water at 20ºC. -The entropy of KNO3(s) is less than the entropy of KNO3(aq). -The KNO3(aq) is more disordered. – The solution is more random than the solid. NOTE. Do not allow credit for a response that only indicates the entropies are different. Explain why the total thermal energy of a sample containing 22.2 grams of NaNO3 dissolved in 200. grams of water at 20. degrees C is greater than the total thermal energy of a sample containing 11.1 grams of NaNO3 dissolved in 100. grams of water at 20. degrees C.
-Both samples are at 20 degrees Celsius but the larger sample has more matter. -The larger sample has twice as many particles. -The total thermal energy is directly proportional to the masses of the samples. Compare the boiling point of NaNO3 solution at standard pressure to the boiling point of water at standard pressure. The boiling point of NaNO3 solution is higher than the boiling point of water. 30 g/mol, 30. g.mol, or for any value from 30.06 g/mol to 30.1 g/mol, inclusive. State the number of electrons share between the carbon atoms in one molecule of the reactant ethene. Explain, in terms of activation energy, why the catalyzed reaction occurs at a faster rate. Explain why the reaction is classified as an addition reaction. Hydrogen atoms are added to the ethene molecule at the site of the carbon-carbon double bond to form a single molecule. Two reactant combine to form a single product. Two hydrogen atoms are added at C=C. An unsaturated reactant becomes a saturated product. The reaction is hydrogenation reaction, which is a type of addition reaction. In a titration, 50.0 milliliters of 0.026 M HCl(aq) is neutralized by 38.5 milliliters of KOH(aq). Show the numerical setup for calculating the molarity of the KOH(aq). – not limited to these answers. Complete the equation below for the neutralization by writing the formula of the missing product. Not limited to these answers. Identify the functional group that appears more than once in the fructose molecule. 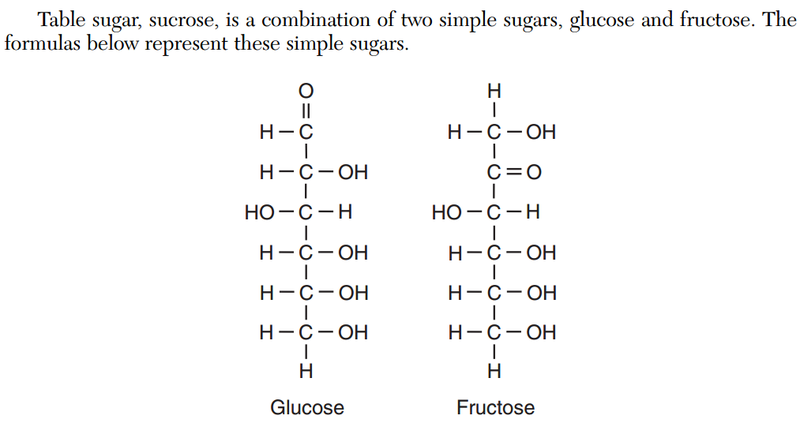 Explain in terms of atoms and molecular structure, why glucose and fructose are isomers of each other. The number of each kind of atom is the same in both, but their structures are not the same. Their molecular formulas are the same but their structural arrangement of atoms is different. The only difference is the arrangement of the atoms. Click on Hints after you have answered the question to check if you have the question correct or incorrect – then select the answer choice – correct if you had the question correct, or – incorrect if you have it incorrect. Write the chemical name for baking soda. 14% or any value from 14.28% to 14.3%, inclusive. State the color of bromocresol green in a sample of NH3(aq). Determine the mass of NH4Cl must be dissolved in 100. grams of H2O to produce a saturated solution at 70ºC. Balance the equation below for the overall reaction used to recover NH3(aq), using the smallest whole-number coefficients. Explain in terms of electronegativity differences, why a C-O bond is more polar than a C-H bond. There is a greater electronegativity difference in a C-O bond than in a C-H bond. The C-O bond is more polar because the electronegativity difference for a C-O bond is 0.8, and the electronegativity difference for a C-H bond is 0.4. The C-H bond has a smaller difference. Identify a strong intermolecular force of attraction between an alcohol molecule and a water molecule in the solution. Determine the vapor pressure of water at a temperature equal to the boiling point of the 2-propanol. Any value from 48 kPa to 52 kPa, inclusive. 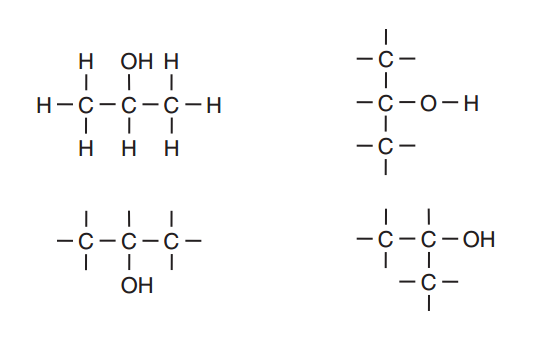 Explain, in terms of charge distribution, why a molecule of the 2-propanol is a polar molecule. A 2-propanol molecule is polar because it has an asymmetrical distribution of charge. The charge distribution is uneven. The center of positive charge and the center of negative charge do not coincide. Draw a structural formula for the 2-propanol. Draw a Lewis electron-dot diagram for the compound that tarnishes silver. In the ground state, an atom of which noble gas has the same electron configuration as the sulfide ion in Ag2S? Compare the rate of the forward reaction to the rate of the reverse reaction for this system. The rate of the forward reaction is equal to the rate of the reverse reaction. State the change in oxidation number for chlorine when the Cl2(g) changes to Cl–(aq) during the forward reaction. Explain why the container must be closed to maintain equilibrium. The container must be closed so that no matter can enter or leave, thus disturbing the equilibrium. If the container is open, Cl2 gas escapes. Determine the number of neutrons in an atom of I-127. Explain in terms of protons and neutrons, why 1-127 and I-131 are different isotopes of iodine. I-127 atoms and I-131 atoms have the same number of protons, but different numbers of neutrons. Both have 53 p, but I-127 has 74 n while I-131 has 78 n.
They have the same atomic number but different mass numbers. The only difference is the number of neutrons. Complete the equation below for the nuclear decay of I-108. Determine the total time required for an 80.0-gram sample of I-131 to decay until only 1.25 grams of the sample remains unchanged. 48.0 d, 48.1 d, or for any value from 48.12 d to 48.13 d, inclusive. Congratulations – you made it to Final Question of the January 2014 Regents Exam!